Welcome, Marva Dasef, MuseItUp author, to Stories a la Mode. I’m excited to tell everyone about your latest accomplishment. If you’ve already read the first two books of Marva’s Witches of Galdorheim series, then I’ll bet you’ve been eagerly anticipating the next book. Wait no longer. Scotch Broom has arrived. A magical trip to Stonehenge lands a witch in the Otherworld where an ancient goddess is up to no good. Kat expects to have a great time on her graduation trip to Stonehenge. However, from the moment she leaves the witches’ arctic island, Galdorheim, she gets in nothing but trouble. Her younger half-brother tries to horn in on her trip, she gets lost in the magical Otherworld realm, is led astray by a supposed friend, then she has to confront a Scottish goddess who’s fallen on hard times. While dodging the goddess’ minions and trying to find her way out of the Otherworld, Kat soon learns she shouldn’t underestimate the old has-been for one second; the crone still has a few tricks that can drain a witch’s magic in a flash. To make matters worse, Kat’s brother secretly followed her into the Otherworld. Now he’s in danger too. Kat has to go one on one with the goddess to save herself and her brother. Watch Marva’s Blog at http://mgddasef.blogspot.com for announcements on giveaways throughout the Merry Month of May. 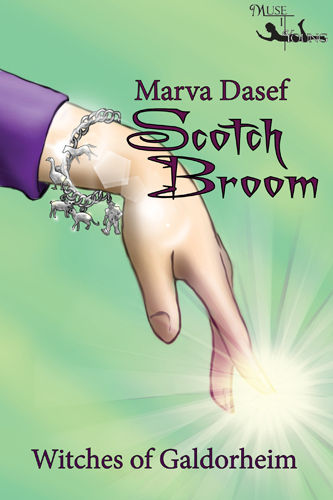 In Scotch Broom, Marva present Glaistig as a vampire woman who has entered the Otherworld because she no longer wanted to live from the blood of humans. Within the magical realm, she can safely feed on the various magical creatures without killing them. Once Marva discovered her, she knew she had to be part of this story. While a vampire, she’s got a soft side that appeals to Rune. In other words, she’s not all bad; she’s just been fabled that way. According to one legend the glaistig was once a mortal noblewoman, to whom a fairy nature had been given or who was cursed with the goat’s legs and immortality, and since has been known as The Green (or Gray) Lady. In most stories, the creature is described as a beautiful woman with dusky or gray skin and long blonde hair. Her lower half is that of a goat, usually disguised by a long, flowing green robe or dress. In the diverse and changing traditions of the Highlands, the Glaistig was seen as both benevolent and malevolent towards humans. In one aspect she even takes the role of the Banshee, wailing at the death of important people. The glaistig may take the form of a beautiful woman, especially one already known to the male victim; after offering sexual favors like a camp follower, she leaves her male victim with his throat cut, every drop of blood sucked from him. Other such tales have her casting stones in the path of travelers or throwing them off course. In some variant stories the glaistig may be seen as benevolent, fond of children and a protector of old people. Libations of milk were poured for her, especially on selected stones; this veneration may be linked with older fertility customs. The glaistig has been described in some folklore as watching over children while their mothers milked the cows and fathers watched over the herds. The glaistig frequented the lonely lochs and rivers in the Highlands of Scotland, such as Ardnacaillich, Donolly Castle, Loch Fyne, Crathes Castle and in Wales at Caerphilly. Rune, Kat’s brother, is searching for his sister while Cailleach is searching for both Rune and Kat by sending one or more of her minions to find them. Glaistig’s job is to find Rune, determine whether or not he’s a vampire, and to bring the boy to the goddess. The smoke woman, for he now recognized the shape as female, wafted toward him on the air. When it stopped a few feet away from him, it slowly gathered color from the moors. Heather green, water blue, dried grass yellow. The colors mixed and swirled and finally settled on the figure, giving her the approximate colors of a woman with blonde hair, a pale, gray face, and dazzling blue eyes staring at him in silence. She wore a long dress and cape, both the color of morning mist. Rune ventured a greeting. “Hello?” The woman didn’t speak, but she moved again, this time circling him. Rune turned to keep her in his sight. “I am Glaistig.” Her voice was as soft as the smoke from which she formed. Without his vampire hearing, Rune wouldn’t have been able to hear the whisper. “Ahem. I’m Rune. Nice to meet you.” Rune wondered whether to offer his hand to shake and decided not to risk it. He’d heard some magical beings poisoned those who touched them. “Well, that’s okay. I’ll just look over there,” Rune replied, pointing in the opposite direction of where Glaistig appeared to be headed. Bodach took two long strides and grabbed Rune’s arm before he could react. “Uh, since you put it that way.” He pulled his arm away from the giant and followed Glaistig. Rune nodded grimly. It looked like he was stuck for now. Still, it might be a good thing. This Cailleach might be able to help find Kat. But why would being a vampire all of a sudden be a good thing? He could sense that if he had not been a vampire, Bodach the giant, would now be crushing his skull between his two gigantic hands. And who was this goddess Cailleach? The name didn’t ring any bells. Rune followed Glaistig, with Bodach close on his heels. Over the thumps of Bodach’s heavy footsteps, he heard the skittering sound of a small animal in the grass as they walked away. Marva Dasef lives in the Pacific Northwest with her husband and a fat white cat. Retired from thirty-five years in the software industry, she has now turned her energies to writing fiction and finds it a much more satisfying occupation. Marva has published more than forty stories in a number of on-line and print magazines, with several included in Best of anthologies. She has several previously published books. 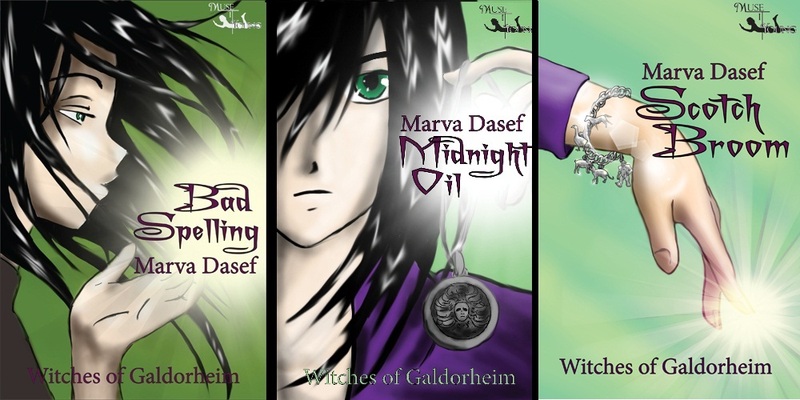 Her latest pride and joy is the Witches of Galdorheim Series from her super duper publisher, MuseItUp.